Since the members of The Academy Is… parted ways in 2011, former lead singer William Beckett has wasted no time on making his next move in the music industry and has flourished as a solo artist. 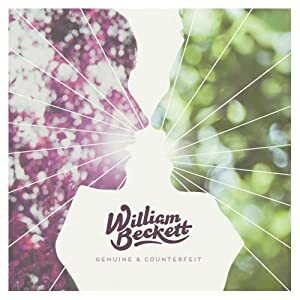 With the release of three EPs in 2012 and an acoustic EP of some of those songs in 2013, Beckett is finally about to release his first full length solo album, Genuine & Counterfeit. Fans can expect a similar sound that they’ve heard on previous records as well as a new twist of bold sounds and a smooth flow of the tracks from beginning to end. This is a deliberate, cathartic project intended to be listened to from start to finish. Beckett says in a statement, "This album is about every relationship you ever took seriously. This album is about getting kicked around, knocked down and rising up a stronger, better person than before; about trying to make it all work. This album is about the delicate balance between what is authentic and what is false; the peaks and valleys between what is genuine and what is counterfeit. This album is the story I never told. Until now." He leaves behind the neatness of TAI albums and lets his different tastes in music come out in each track. It appears that Beckett has established his signature sound of synth-pop mixed with lyrics that make you want to tattoo them down your arm; the loud boom of the drum and the gang vocals perfect for sing-alongs and live performances. There’s pop culture references, such as the first single "Benny and Joon," and guest vocals from Max Bemis of Say Anything and Derek Sanders from Mayday Parade. Maybe this is just the biased review of a Chicago girl with mad love for the hometown boy that’s made it – but for those who have stood by Beckett’s side no matter where he’s gone, this album is rewarding to listen to in every way possible. No matter what project he may be working on, you can be positive that William Beckett has put 110% of genuine and dedicated effort into it. Genuine & Counterfeit will be released on August 20th via Equal Vision Records.